Running a large commercial fleet can be stressful and expensive. We know the pressures fleet operators are under to achieve optimal performance and lower running costs. Here’s how our customers manage to achieve savings of up to 60% on fault claims and generate a return on investment of up to 6 times within 12 months. On average companies that invest in high-quality vehicle CCTV across their fleet have reduced the number of false claims by up to 60% whilst the cameras actively encourage proactive driver improvement, thereby further reducing the likelihood of accidents in the future. If a company is self-insured they could be potentially saving hundreds of thousands of pounds in claims costs each year with our systems paying for themselves up to six times within the first year. Alternatively, they can expect their insurance premiums to be reduced by at least 20%. Many of our happy customers have reported saving more than enough money within the first year to have completely paid for their systems (a single claim worth £80,000 was recently resolved quickly in our client’s favour by giving the insurer vital video footage as evidence to prove liability). Another great benefit of having a reliable vehicle CCTV system is that in the event of a crash or similar incident involving a third party, the video footage can be quickly downloaded and easily exported to any recipient for instant viewing. This helps in proving liability, making the entire claim resolution process quicker and less stressful for all concerned parties, therefore reducing the overall cost of claim administration fees. The most reliable way to safeguard both drivers and vehicles whilst dramatically reducing overall fleet costs is to install high-quality vehicle CCTV camera systems. This will provide ALL the tools a transport operator needs to boost the efficiency of their fleet with the added advantages of making each vehicle safer and helping to reduce the number of false claims and accidents. Once a high-quality CCTV system is installed -both internally and externally- the cameras can be utilised as visual/parking aids which completely eradicate all blind spots when driving and give the driver greater visibility when manoeuvring or parking, significantly lowering the chances of accidentally killing or seriously injuring any vulnerable road users (including pedestrians and cyclists). The result is that each vehicle in the fleet is safer and fully compliant with new initiatives like FORS and CLOCS, in addition to being cheaper to run and more efficient to operate. The Exeros HD TrackEye solution allows fleet managers and transport operators to live-stream HD footage from individual vehicle cameras across the entire fleet directly to their desktop PC or mobile device at the touch of a button alongside accurate GPS tracking via Google maps. The hardware also incorporates a 2-way audio communication into the dash-screen offering a direct link between the transport manager and each vehicle/driver in the fleet -a feature typically used by emergency services and blue light operations. The result of this is that a company can instantly track, monitor and communicate with each of their vehicles and drivers in real-time, a huge advantage in any critical situation and important for safeguarding the fleet from any logistical dangers. This has proved especially useful for hauliers crossing international borders where the danger of unauthorised access by individuals could cause a serious security breach. In some cases, large companies have had to destroy millions of pounds of stock after unauthorised access to load areas has meant cargo is spoiled an unsaleable but high-quality video footage has been vital for use as evidence in court. All video footage is saved on the MDVR and will include accurate latitude/longitude information with current address, average speed and time/date embedded as a watermark in the file. The in-built accident sensor can even detect harsh breaking or a collision, automatically tagging the file and issuing an email alert to relevant managerial staff so they can quickly review and download footage at the earliest opportunity. With a large fleet of drum mixers, concrete lorries and mix-on-site trucks, Transport Manager Glen Beckwith is responsible for ensuring each vehicle and driver is safe, secure and efficient while keeping overall running costs to a minimum. 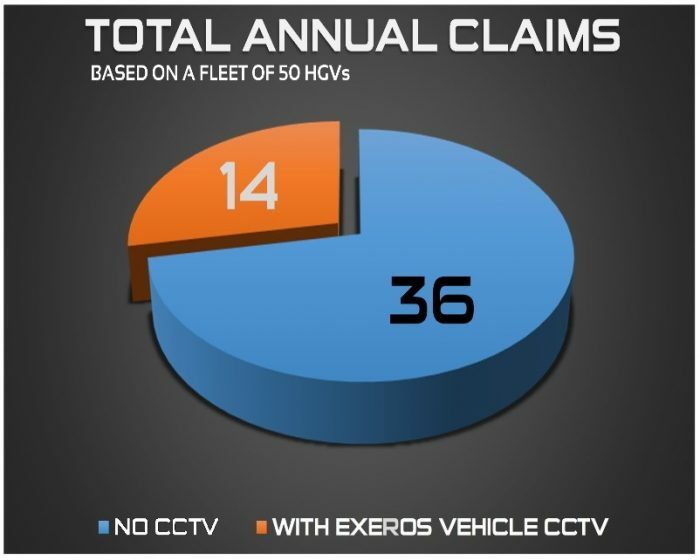 Since fitting Exeros vehicle camera systems for safe manoeuvring and monitoring purposes in 2013 the company has seen a substantial 60% reduction in claims with a steady 32% reduction in incidents from 2014 to 2015. 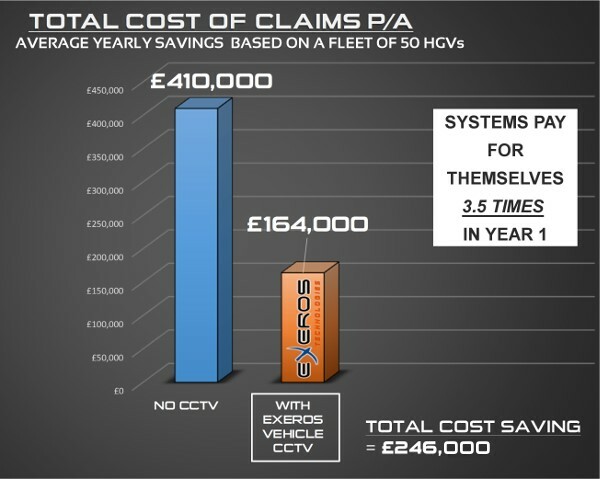 As a result, the insurance company have reduced their premiums by 8.5% per vehicle, meaning that the fleet is now safer and cheaper to run, while evidence of any incidents or accidents can be quickly downloaded, making the resolution process quicker and less stressful while reducing associated costs. The installation of high quality vehicle CCTV systems across the fleet has also meant that Mix It Concrete are now compliant with the highest FORS safety standard and can be proud of their gold status. If you would like to learn more about how intelligent vehicle camera systems can make your fleet safer, protect your assets and save you money, please get in touch with us by calling 0208 303 1188 or complete the form here.